UTV Side by Side Speakers. Kicker Loaded Triple 12 Subwoofer Enclosure Box W/ C12 150W 4-Ohm Subwoofers. This Package Includes the Following Items. (1) Triple 12 Subwoofer Box. (3) Kicker 2010 C12 Single 4 Ohm 12 Subwoofers. Dimensions: Width 34-3/4" x Top Depth 16" x Bottom Depth 19-3/4" x Height 14-3/4". Constructed with High Quality MDF. (3) High Quality Binding Terminal Cups (Accepts Banana Terminal Plugs OR Bare Wire'up to 10GA'). This item is Brand New. 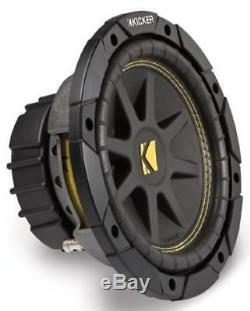 Kicker C12 12 Subwoofer Single 4 Ohm 150 Watts (10C12-4). Recommend Sealed Box Volume: 1.25 - 3.50 Cubic Feet. Recommend Vented Box Volume: 1.75 - 2.25 Cubic Feet. Best-sounding, loudest bass for the buck. Super-rigid, injection-molded cone with 360-degree back bracing. Vented pole piece for heat dissipation. Strong steel basket with coil-cooling perimeter venting. Ribbed surround for strength at high excursion. Tough, yellow double-stitching on surround. We are an Authorized Kicker Dealer. So you know you want a Kicker system huh? Don't worry about it we have you covered. We now offer pre-loaded Kicker subwoofer enclosures designed to deliver some serious bass. We have designed specific subwoofer box packages that function flawlessly together. By taking the guesswork out of building your system you wont have to spend hours finding the right combination of products. We have hooked up every single system and have heard them for ourselves to ensure perfect sound quality, and output. All package enclosures come pre-wired with the subwoofer(s) installed so all you have to do is connect speaker wire to the terminal cup. It doesn't get much better than that! Its easy to hook this system up to an existing amplifier! We also have complete amplified subwoofer box packages that include everything you need. Whichever package you choose you can never go wrong with Kicker! Frequently Asked Questions for this Product. Please allow 24-business-hours after ordering before requesting tracking information. How fast will I receive my product? They DO NOT operate on weekends or holidays. All emails are answered in the order they are received and we do answer them all. We reserve the right to switch you to a comparable product if the original product is out of stock or discontinued. Empty Sub Boxes - Dual 12 Inch. Car Audio - Car Audio Packages. Car Audio - Car Speaker Packages. Car Audio - Empty Sub Boxes. Car Audio Accessories - Amp Kits. Car Audio Accessories - Capacitors. Car Audio Accessories - Car Audio Accessories. The item "Kicker Loaded Triple 12 Subwoofer Enclosure Box With C12 150W 4-Ohm Subwoofers" is in sale since Tuesday, February 23, 2016. This item is in the category "Consumer Electronics\Vehicle Electronics & GPS\Car Audio\Car Subwoofers". The seller is "hifisoundconnection" and is located in Nixa, Missouri. This item can be shipped to United States.